"The power of this idea is contagious, but it requires a determined campaign of public education. 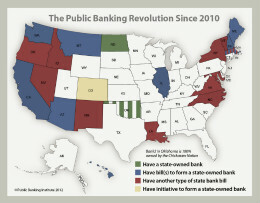 The Public Banking Institute has led the way. With the support and educational resources provided by PBI, our Pennsylvania Public Bank Project has initiatives underway at the municipal, county and state level." Public banking is a powerful idea, but to get it going, it's important to have both a national and local network of associates. The national network -- the Public Banking Institute -- is working on national public banking issues, holding the national annual conference, providing coordination and communication, and otherwise enabling local efforts, The local network of associates -- your local Public Banking Institute chapter -- works to move the dial on public banking at the city/county/state level through organizing and advocacy work. Forming a PBI Chapter can be a useful steppingstone toward establishing a public bank in your city, county or state. The Public Banking Institute will provide you with the necessary education, training and information needed for you to be as successful as possible. But keep in mind that this is not going to be a short journey. Since we are truly changing our economy, culture and society with public banking, it may take awhile! Change will only come as we make our case and advance our mission within each city, county or state in which we are engaged. We're up for it -- are you? 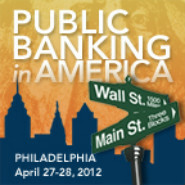 Join us and see how the Public Banking Institute can help you start a public bank. Depending on your strategy, you can use any of our campaigns to further your success towards establishing a public bank. They include the Move OUR Money campaign and the Return to Prospertity campaign. Other resources include our Great Public Banking Debate program and our Student Banking Project. All campaigns and programs are found here. If you can devote two hours to begin to develop your strategy, we'll help you. It's as simple as that. We use the Midwest Academy Strategy Chart -- a one page chart that you can either fill out on your own or complete with us by simply joining one of our regular conference calls every Friday morning at 9am pacific, for one hour. We will walk through the chart and discuss the tradeoffs as we all complete our Strategy Charts together. This is a great first step because you'll quickly realize that your Strategy Chart is your plan of action -- it will tell you exactly what needs to be done. Join any of our weekly Friday morning calls at 9am Pacific. We'll review your Strategy Chart and discuss how best to organize your advocacy efforts. Register here for the next 60min conference call. Once your Strategy Chart is created it will go to the PBI Board of Directors for review and approval. The Board meets every Monday night so it will not take long for review. "Vermont is a few steps closer to having its own bank because of the resources the Public Banking Institute has brought to bear. PBI is on the radio, planning a Symposium with us, and helping us address important issues as we get closer to success." Labor, Business Associations, New Economy Associations, Food Systems & Agriculture ...all pulling together to help your local and state efforts! "Our state leadership has relied on information from the Public Banking Institute to write bills, to resolve specific issues, and to provide us with the points we need to further public banking in Washington State"
Partner with the Public Banking Institute and you'll soon have a fiscal sponsor, a website, branded email, and an education plan, all at no cost to you. The Montana public banking website, an example of some important messaging provided by PBI, is here. Tell us about your city county and state, and we'll provide you with a roadmap on how to achieve success. Because public banking is a powerful idea, once you introduce it, people will connect the dots and quickly realize the benefits. And, if you need help, we're forming the Public Banking Coalition to provide you with grassroots support and direct access to key stakeholders. We're a growing network of people sharing ideas, building friendships, celebrating wins, and committed to establishing a network of public banks for the benefit of our communities. "New Jersey is closer to a public bank because of the clarity and purpose behind the Public Banking Institute. I would not be as successful moving this project forward without the help of PBI."